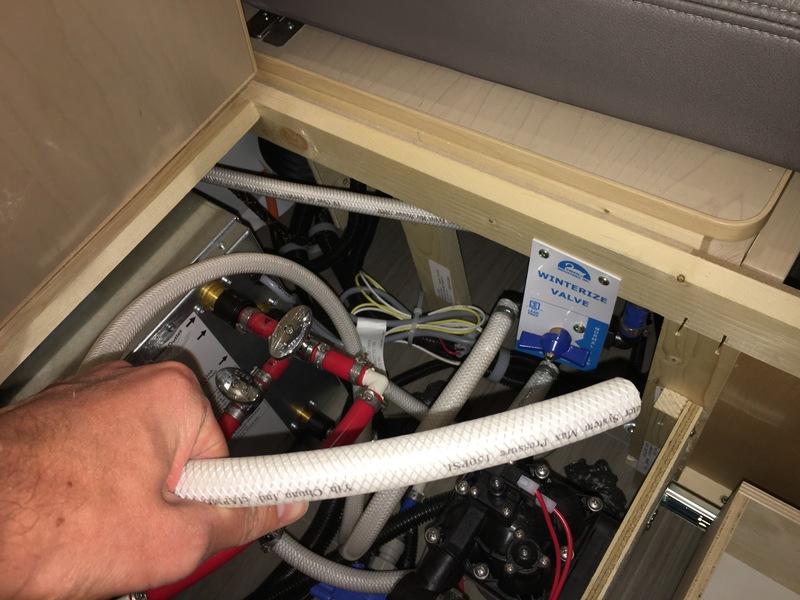 Here are some steps that will hopefully help understand the process of filling your water tank from the exterior suction hose in a 2017 Serenity. The process is essentially the same as the "sanitization" steps laid out in your owners manual. Place the suction hose attached to the winterize valve into the jug of potable water (if you winterized with antifreeze, I'd recommend dunking the hose a few times to rinse off any residual antifreeze). This valve & hose are located under the dinette inside the coach. Turn the winterize valve to "WINTERIZE". This enables the use of the suction hose. In the exterior service compartment, turn the "water fill selector valve" to WATER TANK FILL ONLY. This should be the horizontal position. Turn on the water pump switch (located in the interior service centre). The pump should start sucking water up through the suction hose into the tanks. If the pump stops running, open a faucet a little bit to cause the pressure change to start the pump again. Once the tank has been filled to the desired amount, return all valves to previous positions.